The server was accidentally deleted. There's no way of retrieving it. 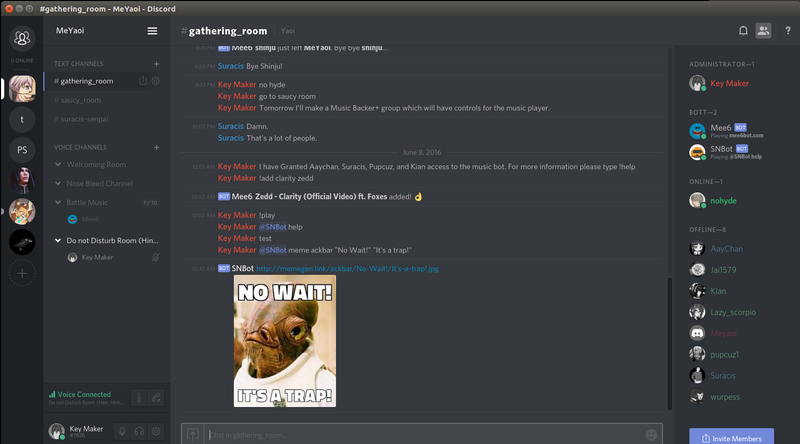 If you wish to go to a chat, please ask suracis as he has his own server. Thanks. Yet another bot has been added, and this one is fun! Because it will talk to you, it will play games with everyone, and even make memes!! Everyone has access to this bot! Also, Here is a How-To for Discord, it's just a simple 5 min video that walks you through the basics. Just added the ability to use BOTS, this will help us manage users and work with the server better. In the future this can be upgraded with music.